Note: All webinars are available for purchase to view after the class has ended. All webinars are stand-alone courses, though they will work synergistically and enhance each other. Webinar purchases include one-on-one consultations with Sabin Howard via Skype or phone. 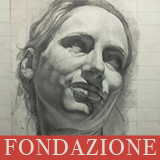 If you always wanted to learn how to draw the figure, you can now study with a contemporary figurative modern master. This class was taught by Sabin Howard for over 20 years in some of the best figurative art colleges in the country.The principles in this class are the result of 30 years of studio practice with over 50,000 hours of working from life models. If this is something you always wanted to do but didn’t know how to proceed, now is the time. The principles in this class are the result of 30 years of studio practice with over 50,000 hours of working from life models. The class was also taught for 15 years at the best graduate figurative schools in the country. If as an artist you are intent on mastering the human figure, this 5 week intensive is a fantastic resource and you owe it to yourself to attend. The knowledge from this class will change how you see the figure and ultimately increase your ability and creativity as an artist. This class covers knowledge organized by aesthetics.